Any carpenter will tell you that building squares and rectangles are the easiest shapes to frame. However, if labor time is not a concern, then circles are perhaps the most magical shapes for treehouses. Our treehouse builder affiliate, Tree Top Builders, often builds hexagons and octagons as a compromise. Any regular polygon makes the math component of carpentry easier. But even tougher than circles, are building irregular, organic, wavy shapes out of wood which usually comes straight. 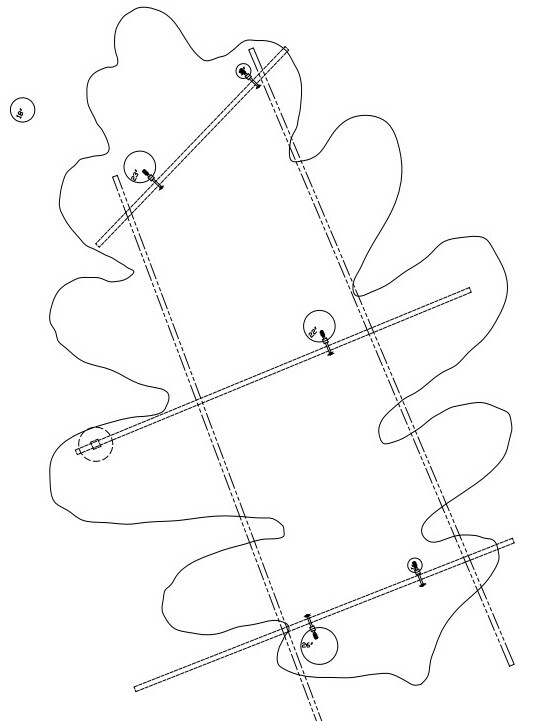 That being said, we've had this idea to build a white oak leaf shaped treehouse platform for a very long time! Given the size of this platform, it needed to be designed to support approximately 40,000 pounds. That necessitated adding a post to help out the middle tree. We were able to take a downed oak log from our forest floor, haul it about 150 feet through the woods using heroic levels of brute strength by our workshop crew in the spring of 2015 (it took 12 people to drag it... lifting was out of the question). But the effort was worth it, as we have a natural looking post that should last a very long time. The joists are all blocked down the middle and near each end. The purpose is to stabilize the railing posts, but not have to build a curved rim joist. We have seen examples of slightly curved rim joists before, but it's nearly impossible to make sharp curves like these with any kind of lapping or kerfing methods we are aware of. The netting and rope handrails are easy to follow any shape we can dream up. The decking is where we accentuate the irregular curves. The two trees at the front come up in between lobes of the leaf, which allows people to peek around the corner, and neatly keeps the structural beams accessible for adjustments as the trees grow. Treehouse enthusiasts will appreciate these fine details. If you are interested in learning more about treehouse construction, you might consider attending one of our workshops. 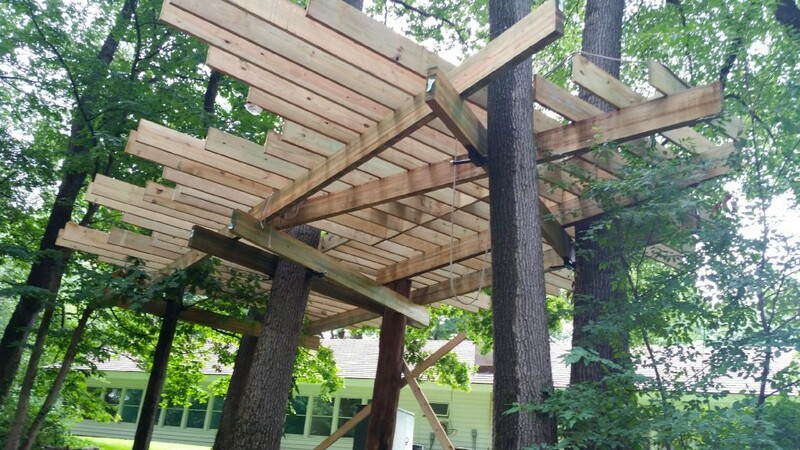 We teach treehouse building theory, and then we participate hands on in a unique project to give you experience. The class is appropriate for beginners, contractors, designers, professional treehouse or canopy tour builders, and curious onlookers! Visit our treehouse construction workshops page for more information.